Videogames will soon assist in keeping the President of the United States safe, albeit in a very indirect way. The US Secret Service - the organization that, among other things, guards the President of the United States - is dropping the scale models it's used for training for the last 40 years, in favor of a new system based on videogame technology. In the past, the Secret Service used the models - known as "Tiny Town" - to recreate scenarios and locations where a potential security threat might occur. These included places like airports, hotel interiors, and outdoor stadiums. Agents could simulate different parts of a dignitary's itinerary, from the moment he or she arrived at a site, to the moment he or she left, and everything in between. It was decided, however, that the Secret Service needed a more dynamic training tool, and so the agency turned to Bohemian Interactive - best known for making the Operation Flashpoint and ArmA military sims - and its Virtual Battlespace technology. The VBS software was developed by Bohemian's Australian branch, which was founded specifically for making military training simulators. The VBS system has been around since 2002, and a number of US armed forces have made use of it, including the Marine Corps, and the Army. 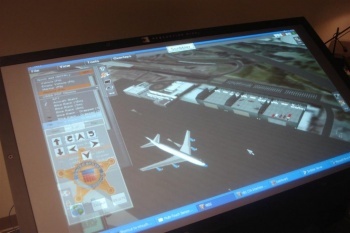 The Secret Service has used the first version of the software in the past, but always in conjunction with - and not instead of - the Tiny Town models. The second edition of the VBS software can do everything that the models can do, plus things that would be impossible, like recreating toxic gas clouds and similar threats. It's not just the software that's new either, as the Secret Service has also invested in some pretty impressive hardware. Training will now take place in kiosks, made up of a computer running the VBS 2 software, a 55" touch screen monitor, a camera/projector set up, and a 3D capable LCD TV for conducting briefings. This equipment will allow teams of up to four trainees to put together a plan quickly and efficiently, and review it from a both a third-person, and a first-person perspective. The Secret Service hopes to have the kiosks all up and running by this spring. Obviously, this is a serious training tool for teaching people how to deal with genuinely dangerous situations, but at the same time, it sounds like it could make for a really interesting game, not dissimilar to the planning sections in the older Rainbox Six titles. Unfortunately, it's a little hard to imagine the Secret Service going for the idea.